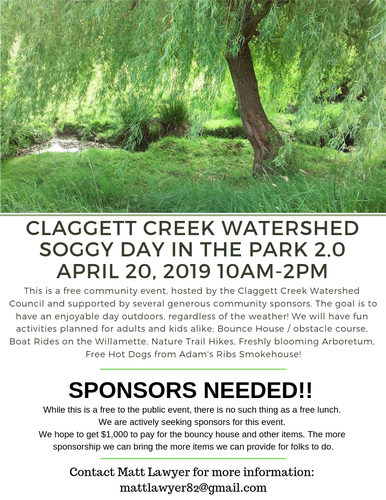 This is a free community event, hosted by the Claggett Creek Watershed Council and supported by several generous community sponsors. The goal is to have an enjoyable day outdoors, regardless of the weather! We will have fun activities planned for adults and kids alike: Bounce House / obstacle course, Boat Rides on the Willamette, Nature Trail Hikes, Freshly blooming Arboretum, Free Hot Dogs from Adam's Ribs Smokehouse!